Gardeners of the Inland Northwest, we are on the home stretch. Before we know it, we’ll finally get to plant seeds out in the garden. I start all of my vegetables from seed each year. Some should be sown directly in the garden because they don’t like their roots to be disturbed. Once you plant them, they want to be left alone. Other crops need a head start indoors, where the weather is always pleasant and they’ll benefit from some early pampering. If you’re unsure which method to use, let’s walk through it. As a general rule of thumb, root crops don’t tolerate transplanting well. This includes carrots, parsnips, beets, turnips and rutabagas. For best results, plant them directly in the garden in early spring. Follow the seed packet directions for the depth to plant them and how much to space the seedlings once they’re 2 to 3 inches tall. While thinning them is tedious, it will give them room for optimal root development. Onions are a bit of an exception to the above rule. They can be grown from seeds, small bulbs called “sets,” or from plant starts. I prefer the last option but I do know gardeners who sow onion seeds thickly in flats and gently tease apart the young seedlings later so they can be planted into the garden. I prefer sowing lettuce, spinach, Swiss chard, arugula and other salad greens directly in the garden. They just seem to do better when they get to sprout and grow in the same place. Once again, it’s important to thin the plants to the recommended spacing on the seed packets. Although these crops aren’t developing large roots, the plants benefit from proper spacing in three ways: the air around them allows the leaves to dry out which decreases the chance of rot; the space between each plant makes it more difficult for pests like slugs to move freely from plant to plant; and that extra room allows the leaves to reach their full potential. Cole crops such as broccoli, cabbage, cauliflower and kale benefit from being started indoors a few weeks ahead of time but can also be sown directly in the garden. 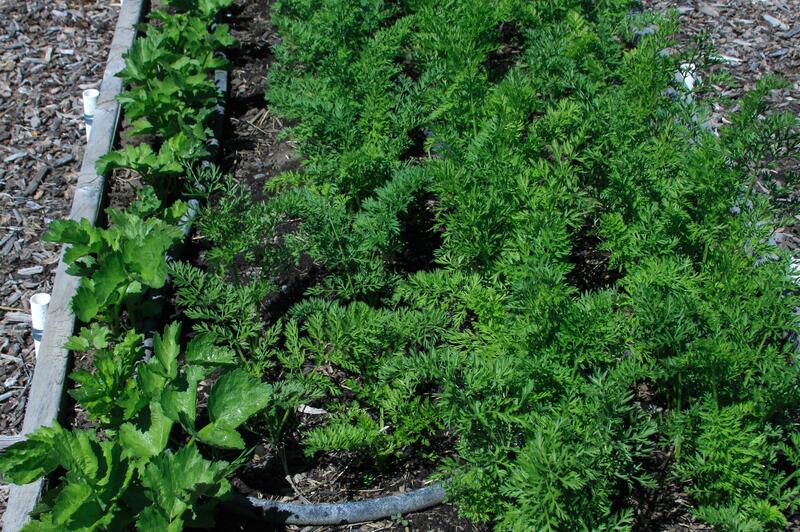 Crops that need anywhere from four to eight weeks’ head start include artichokes, eggplants, celery, peppers and tomatoes. I sow the seeds in planting flats of various sizes and wait until they have a few true leaves before transplanting them into a larger container. That gives their root systems more room to develop before it’s warm enough to plant these crops outdoors. I start some vegetables indoors about two weeks before being moved out to the garden. They are cucumbers, melons, pumpkins, and summer and winter squash. You might be surprised to learn that I start my bean, corn and pea seeds indoors about 10 days before planting them out. Not everyone does this but we have a lot of birds in our garden, which love nothing more than to nibble on freshly-sprouted seeds. By starting the seeds ahead of time, the plants can better fend for themselves when transplanted outside. And besides, seeds started indoors germinate, or sprout, much better because of the controlled conditions, so I get my money’s worth. I also can transplant them at the correct spacing, which eliminates the need for thinning later. If you’re looking for suggested planting dates for all vegetables, I’ve created a seed-starting guide on my new website, www.susansinthegarden.com. Look for it under the “Guides” menu. Susan Mulvihill is co-author, with Pat Munts, of Northwest Gardener’s Handbook. Contact her at susan@susansinthegarden.com and follow her on Facebook at facebook.com/susansinthegarden.